We've seen actor Will Smith don many iconic looks, from Mike Lowrey in Bad Boys to Deadshot in Suicide Squad. He even played an ESPN reporter in Anchorman 2. But we've never seen him like this. 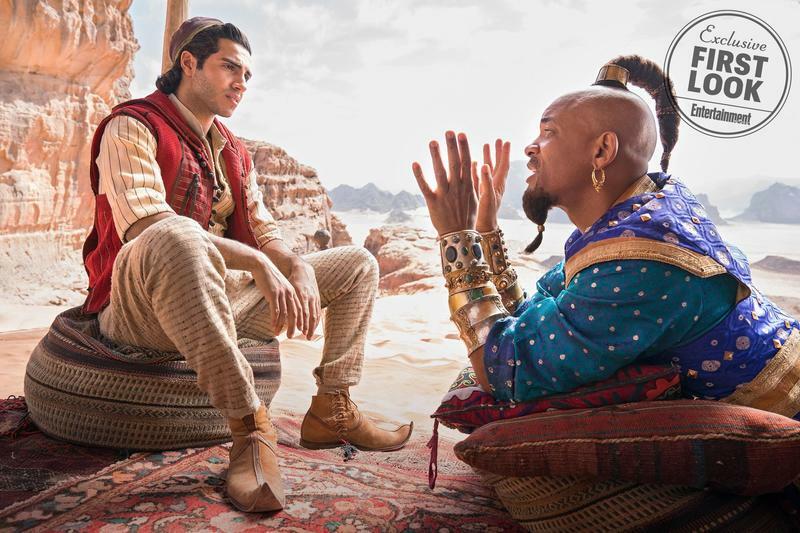 Entertainment Weekly has released the first photo of Smith as Genie in Guy Ritchie's live-action remake of Aladdin, and it's something. Smith's character keeps Genie's iconic hairstyle and goatee, and it's a look unlike anything we've seen from the actor. While the first few images show Smith's Genie with a more human-like appearance, he'll undergo many different looks throughout the film, including the blue form fans are familiar with. But the similarities end there. According to Smith, his version of Genie is a "homage to Robin Williams but musically different." One Disney executive apparently described Smith's Genie as part Fresh Prince, part Hitch, referring to two of the actor's most iconic roles. "Just the flavor of the character would be different enough and unique enough that it would be in a different lane, versus trying to compete," Smith told Entertainment Weekly. Smith's take on the iconic character will also be much more vain than the one played by Williams all those years ago. "I like the fact that our Genie has an ego and is a little bit vain and he cares about how he's presented because he's been doing this for a very long time," explained Aladdin director Guy Ritchie. "I think it'll stand out as unique even in the Disney world," Smith said. "There hasn't been a lot of that hip-hop flavor in Disney history."